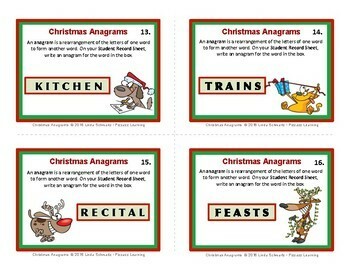 T A S T E R.
Students unscramble the letters in the word in a green box to write an anagram. They list their words on a Student Record Sheet. Many of the words have more than one possible answer. Accept any word that uses the exact letters in each bold word in the box. 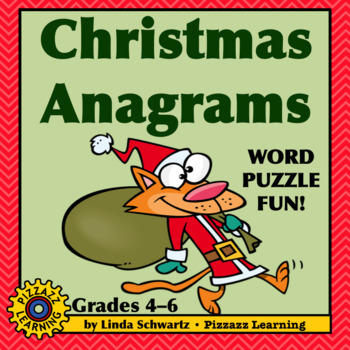 These word puzzles are ideal for your early finishers! For extra durability, laminate the Task Cards before cutting them apart. They look awesome in color but reproduce great in grayscale. Thanks for visiting Pizzazz Learning. 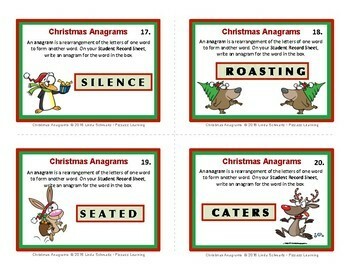 I hope your students have fun solving these Christmas anagrams! Be FIRST to learn about NEW products and SALE notices. Click the GREEN star in my store to become a FOLLOWER of Pizzazz Learning. 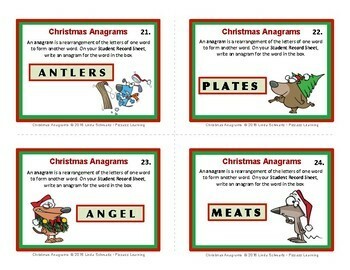 If you purchase Christmas Anagrams, please take a minute to rate it to receive TpT credits.